Looks like Mr Black is Santa watching doesn't he? 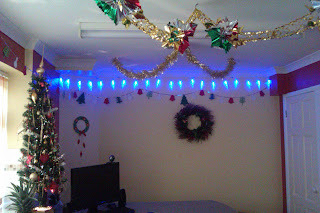 And Its not to late to enter my Christmas Count Down Surprize give away so get you cameras out and send in your photo's of you trees and decorations with your selves in if possible and send them to me at rachel dot dejong28 at googlemail dot com the last post for my give away is on Christmas Eve 24th December and the one I like the best will win a surprize gift after Christmas!So What are you waiting for I need some more entries! Here's my kitchen lit up.Catch you tomorrow! Mr. Black sure is on Santa Watch! Hope Mr. Black reports to all of us when he sees Santa coming down the pike. That is such a pretty tree. And Speedy, your house looks great too. Take care. Love the decorations! I can't have very many around because of a certain mischievous puppy - so I appreciate the work it takes! Looks lovely! Hello Speedy! Thanks for sharing my photo and entering me in your contest. I might make some new friends, too! Love those blue lights in your house. ...your house looks beautiful all Christmasized! We will see if we can get our Mommy to decorate so we can enter. 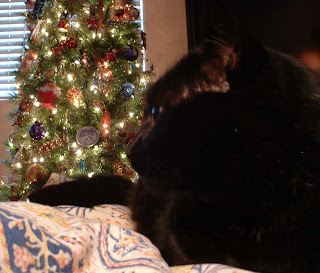 Mr Black looks very handsome with his tree. Just a hop and a few binkys away now, eh Speedy? OH,i LOVE your kitchen all lit up!! so festive! That sweet black cat looks so much like my Midnight, RIP....I have seven cats right now----all of them were strays. The momcat ( I have her too, now) had 2 litters of kittens in my garage and back yard. I got them spayed/neutered and ended up bringing them indoors when it got cold, since I coudlnt' find anyone to take them. They are all so sweet! Merry Christmas to all of you!! You can find me on Facebook----Lee Steele in Texas. Is that not the best photo of Mr. Black! And your kitchen - wow! Mr. Black is our new friend - love the picture! Hey! That cat looks like my Spider...only less evil. meowsers!! Speedy, you and your family go all out for the holidays! pawsome decorations all over! !